Wunderbars constant tension stretcher bars help you gain control of your canvas stretching. Without the need for a canvas stretching machine, Wunderbars are like no other stretcher bars or stretcher frames available. Wunderbars stretcher bars go together square in seconds, so there's no more need for malletts or expensive picture framing equipment. Stretching Canvas with Wunderbars is simple too. Theres no need for stretcher pliers or canvas machines, the stretcher bars do all of the work with the spring loaded blocks. Keeping constant tension after the stretch is what Wunderbars stretcher bars do best. Theres no need for time consuming re-stretching or hammering wedges or keys, the spring loaded "spring blocks" keep the canvas under tension no matter the rooms environment. With very little experience needed Wunderbars stretcher bars are perfect for any business that uses canvas frames or traditional stretcher bars to stretch canvas and can easily be used by a novice or a professional canvas stretcher. This site will guide you how to use and create canvas's with Wunderbars constant tension stretcher bars and give you hints on canvas stretching in general, including those elusive canvas corners. Wunderbars can change the way you stretch canvas. We've got information on how to fold corners and how to print your canvas the easy way with Wunderbars. Take a look at the advantages and see for yourself how we're evolving the way you stretch canvas. Wunderbars come in two great stretcher bar profiles. 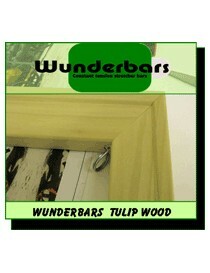 Tulip Wood profile a hardwood measuring 33mm x 57mm and Wunderbars White, from Softwood Pine measuring 33mm x 46mm. 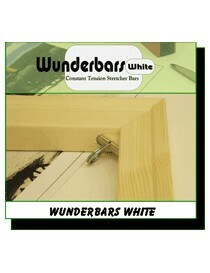 Wunderbars/Canvas Stretcher Bars There are 2 products.